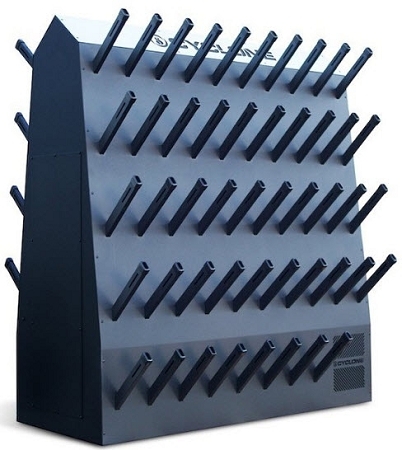 The Cyclone Boot Dryer is designed for industrial use, this free-standing dryer holds any combination of 48 pairs of gloves, helmets, athletic shoes, or ski/snowboard/work boots. From rental shops to ski areas and resorts, warehouses, and hockey rinks this highly effective drying system will provide quick, complete drying for high volume areas with limited floor space. The Cyclone Boot Dryer produces 700 cubic feet of 95-105° F air per minute per pair of boots, allowing complete drying of 48 pair in 45 to 60 minutes. The powerhouse of a motor in this unit is custom made for Cyclone Dryers. A precisely designed cabinet shape maximizes air pressure. With this combination, you can expect wet gear to be dried in the amount of time it takes to have lunch. The Cyclone Boot Dryer is equipped with a 60 minute adjustable timer which allows control of the drying speed and temperature to insure maximum versatility and efficiency. * 4 FREE Tube Covers with your order TODAY! * Redirect air from unused tubes when drying limited gear. * Estimated shipping cost $375.00. This model ships on a pallet via. a LTL truck. The ship cost my vary depending on shipping address, residential delivery, lift gate truck, etc. If there are any adjustments to the ship cost we will notify you before completing the order for your approval.